Incorporates a surfalloy coated clamping surface. The Instron® pneumatic tire cord grips provide a convenient method for clamping tire cord and braided wire during testing. A guide pin allows for easy loading onto a graduated radius cam, which provides a stress-reduced clamping area on the specimen. The clamping mechanism can be activated either automatically or through a footswitch, which allows for hands-free grip operation enabling the specimen to be held with both hands for easy loading. 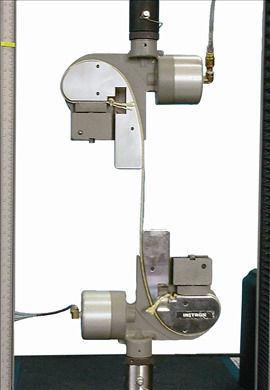 Pneumatic cord and yarn grips provide selectable clamping force to accommodate different materials and excellent follow-up action that compensates for decay of the holding force due to specimen creep.